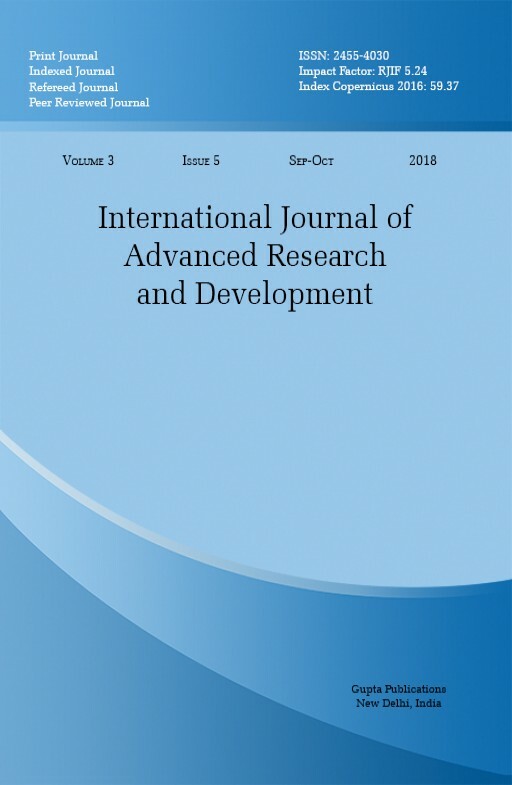 International Journal of Advanced Research and Development is indexed, refereed, peer reviewed and open access journal is designed to publish research articles in Engineering & Technology, Management, Medical Sciences, Medicine, Social Science, Education, Agriculture, Geography, Advertising, Accounting & Finance, Botany, Business Research, Chemistry, Commerce, Computer Application, Consumer Behaviour & Relationship Management, Corporate Governance, Earth Sciences, Economics, E-commerce, Bioscience, Entrepreneurship, Fisheries, History, Human Resources Management, Information Technology, Library Science, International Business, Law / Criminology, Life Sciences, Logistics and Supply Chain Management, Mathematics, Performing Arts, Physics, Psychology, Health Care, Fine Art, Industrial Relations, Architecture, Marketing communication, Marketing Management, Microbiology, Nursing / Pharmacy, Nutraceuticals, Physical Education, Philosophy, Political Sciences, Psychology, Population Studies, Selling and Marketing techniques, Strategic Management, Total Quality Management Training and Development, Sociology, Veterinary Sciences, Languages (e.g. Hindi, English, Sanskrit, Urdu etc.) Apiology, Arachnology, Arthropodology, Cetology, Conchology, Mosquito Taxonomical Studies, Vector (Mosquito) Biology, Vector Ecology, Prevention and Control of Mosquito/Vector-Borne Diseases, Vector Competence of Vector-Borne Diseases, Biopesticides/Botanical Insecticides in Vector Control and Management, Biological Control of Vector Mosquitoes, Vectors “Parasite Interaction, Epidemiology, Parasitology, Surveillance and Control Technology of Vectors, Applied Fields of Mosquito Research, Entomology, Helminthology, Herpetology, Ichthyology, Malacology, Myrmecology, Nematology, Neuroethology, Ornithology, Paleozoology, Planktology, Primatology, Zooarchaeology, Zoosemiotics, Vector Molecular Biology, Molecular Endocrinology, Parasitology and Immunobiology, etc.